Half Day and All Day Activity camps at Westside are available on school closure days, school breaks and throughout the summer. We offer Dance, Gymnastics and Preschool camps for ages 3–12 with various themes and activities. Gymnastics camps are for ages 3–12 depending on the camp. Campers are in the gym tumbling, jumping, learning various skills and playing games. Dance camps are for ages 5–12 depending on the camp. Campers have lots of time in the studio learning techniques and routines. Preschool camps are for ages 3–6. Campers might be in the gym or dance studio or both depending on the camp. Descriptions of all sessions are available when registration opens. 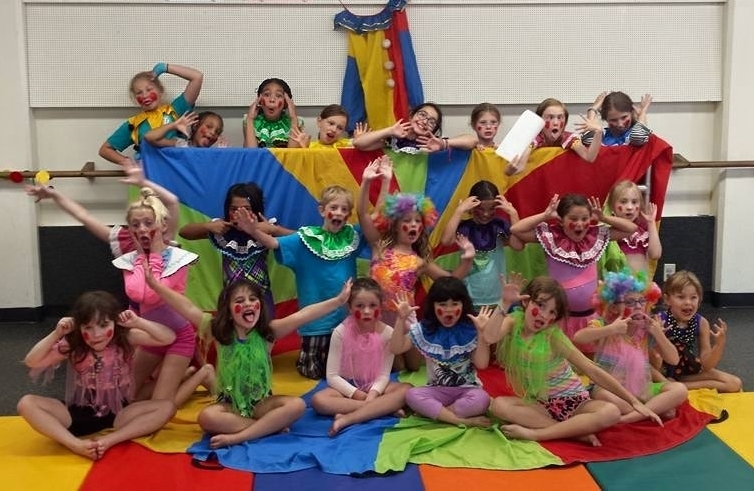 Dance, Gymnastics and Preschool camps are available with various themes and age groups. Gymnastics camps are divided into groups by age. Campers should dress appropriately (see attire requirements below) and bring a healthy snack for mid-morning break. All Day Activity campers choose one of the morning camps. All Day Activity campers enjoy a morning Dance or Gymnastics Camp followed by fun on a field trip after lunch plus gym time, games, arts and crafts in the late afternoon. Review policies below for attire and what to bring. • All Field Trips are within walking distance of Westside Academy. • Campers are required to wear the Westside Camp T-shirt for all off-site Field Trips. • Movies will be chosen as soon as they are released to the public - parents will receive an email ahead of time informing them of the movie choice - popcorn and water will be provided. • For field trips to Pizza Caboose - all campers will receive their choice of either Cheese or Pepperoni Pizza, with water. Gluten free crust is available to campers who need it, but we must have notification in writing at least 1 day prior. All Day Activity Campers – join us for a fun morning Dance or Gymnastics Camp. After lunch, campers will either remain onsite or head out nearby to one of the following field trips. Then, it’s back to Westside for an afternoon snack, games and gym time. Monday March 26th – Bowling at Tigard Bowl Get the good times rolling at the alley, slip on those wacky shoes, and come show off those bowling skills! Wednesday March 28th – Acro Workshop at the "W" Join us for tumbling, double tricks, balance tricks and trampoline work. Students will also learn an acrobatic group routine to fun, upbeat music. This is an in-house field trip. Thursday March 29th – Ice Cream Date at Baskin Robbins Celebrate Springtime and cool down after an active morning camp, with a nice brisk walk to enjoy some much deserved ice-cream. Friday March 30th – Game Day, Crafts and Pajama Day It’s Pajama day all day! Students will play tons of games, make lots of crafts and put their their creative minds to use. A great way to unwind from an active week. Appropriate dress for morning camp – Leotards for girls, and elastic-waist shorts & t-shirts for boys for Gym and Preschool camps. Comfortable clothes with appropriate dance shoes for Dance camps. Appropriate dress for field trips – Rain jacket with a hood, light jacket, socks and tennis shoes every day - we will either be walking to nearby locations or will be playing outside. Please double check that you have socks, especially for days that we go bowling. An in-house credit will be given to students who give 1 week prior notification for all camp cancellations. We have a no refund policy. Students who cancel the day/week of camp are welcome to pick another day/week of camp to make up for the cancellation (subject to availability). Check-In – Campers should check in at the front desk (parents need to sign them in) and then they will be directed to the appropriate Dance Room/Gym, depending on their camp choice and time of arrival. Sign In/Out – Parents need to sign their child in/out at the front office each day for security reasons. When you arrive to pick up your child, the office will contact the Camp Supervisor to bring your child to you. Payment is due on or before the 1st day of each week of camp. A 10% discount is given to additional family members. We appreciate advance registration, in order to staff accordingly – call the office to register your child, 503.639.5388. Same day registration requires an $8 additional fee (subject to availability). Backpack with name on the outside – everything must fit in it: snack, lunch, water bottle and sunscreen (Please label all items). Morning Snack – A snack for the morning camp is required. Please send healthy snacks. (We provide a healthy afternoon snack). Cold Lunch & Water Bottle please put your child’s name on everything. Westside Camp T-shirt – ($10.00) required and worn for all off-site field trips. No valuables! Please leave your valuables at home, such as ipods, kindles, etc.